Thanks to the folks at #1book140 for including me in their 2-month Middlemarch read-along, for setting up a Q&A with me and Stephen Burt, and then for preparing this Storify of it! We both really enjoyed going back and forth about this great novel, as I hope you can tell. 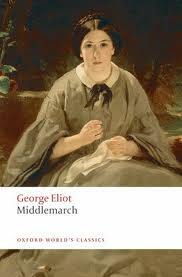 I am capable of going on at much greater length about Middlemarch: if these 140-character tidbits whet your appetite, you might enjoy this list of my top 10 reasons for liking George Eliot so very much, this essay on the miserable morality of Middlemarch, or my review of Rebecca Mead’s My Life in Middlemarch. You can read the Storify of Rebecca Mead’s#1book140 Q&A here. You can read Stephen Burt’s review of her book here; and you can watch his wonderful TED talk about why people need poetry here. Addendum: Here’s the missing first part of my answer to Stephen’s first question, without which some of what follows may seem a bit garbled!